Black Friday Giveaways – EZ Sox! I hope, for your sake, that your kid isn’t nearly as opposed to putting on their own clothes as mine is. Ali is just not a fan – apparently I do a much better job at it than she does. I’ve made some progress with her, but there are still a few items of clothing that she struggles with – like shirts and socks. So anything that can help me win the battle of not having to dress her is awesome. And EZ Sox are a great solution! Aren’t they adorable? And, thankfully, they have skid-proof writing on the bottom to help with slippery floors. I was extraordinarily frustrated this year that Ali has apparently grown out of most brands of skid-proof socks – which isn’t cool since we have hardwoods! They sent Ali a pair to try out, and I handed them to her to figure out on her own. She had them on in half a second! …And, of course, loved the look of them! If you’d like to win a pair of your choosing of these cute and useful socks, EZ Sox has offered to give away their awesome socks to two lucky people!! Just comment on this post to be entered. Previous Post Black Friday Giveaways – Dreamy Eyes! What a brilliant idea! Please enter me! What a fun and great idea! Thanks! How cute…little Colton would love these! Very educational too! Learn colors and animals while keeping your feet warm. I’d love to win a pair of these for my baby girl. What a creative idea! I have one kid who loves wearing socks but will not put them on himself and one who hates wearing socks. EZ Socks may really help me! I am a fan of EZ Socks on Facebook. Thanks! Wow! Those are awesome! We have hardwoods too, and slippage abounds without the skid-socks. I might have to get some of those! What a great invention! This is the one part of dressing themselves the preschoolers in our house just can’t conquer! 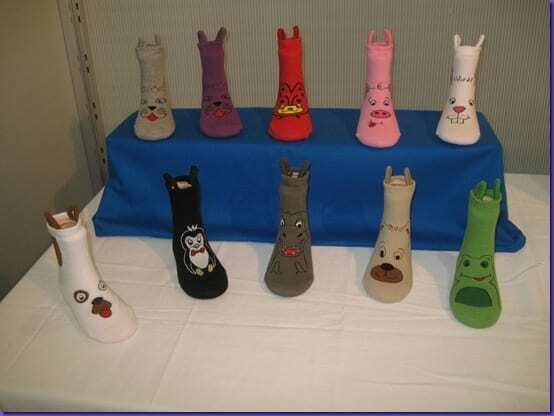 lol, they look like adorable little socky rainboots with the handles! These are awesome! I’d love to get a pair for Jack to try. I hope my other comment posted. I do follow your blog. My 5 yr old could so use these! she still has trouble w/ long songs (ie anything that’s not a ped). ugh! 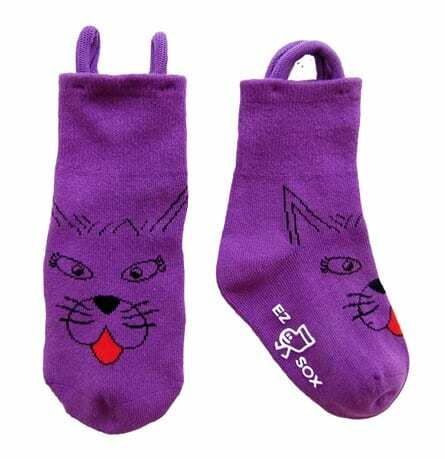 I love the purple kitties one for my daughter for a stocking stuffer! Oh gosh, these would be perfect for my little grandaughter! I hope I win!! Oh these are so cute my son would so love the froggie ones thanks!! My 2 yr old son would love these…no more hissy fits because he wants to put them on “all by himself”….but can’t! I think the purple kitties are adorable! I follow EZ Sox over on Facebook. I’d love to win these for my littles. THANK YOU! Liked EZ Sox on FB. Following you via twitter – surromama2. i want to win these ez sox for my grandson. This would be a great gift for my friend’s daughter. I like the black Penguin style. Those are too cute! My 3 youngest need help with their socks, what a great idea for a product. Adorable and I like the non-slip soles. I know a certain little girl who would love these, enter me please. Follow on facebook and twitter too.